Way back in the 1970s, hardware-hacker hobbyists built kit computers like the Altair 8800 — and in doing so paved the way for the computer revolution that would reshape every facet of modern life. Today the same breed of people are building and selling kit flight controllers for unmanned aerial vehicles (UAVs). Just sayin’. Drones are far from new: the US military has been using them heavily for over a decade. (What else did the US military pioneer, back in the 1970s? Oh, right. The Internet.) UAV tech has long since metastasized around the world. India’s private sector builds UAVs for both military and scientific purposes; Lebanon’s de facto government Hezbollah has used Iranian-built drones for years; earlier this month, QinetiQ’s solar-powered Zephyr set a world record by flying for 2 weeks nonstop; and, of course, the French-built, iPhone-controlled AR.Parrot has brought UAVs to the masses. All awesome, and all innovating fast. 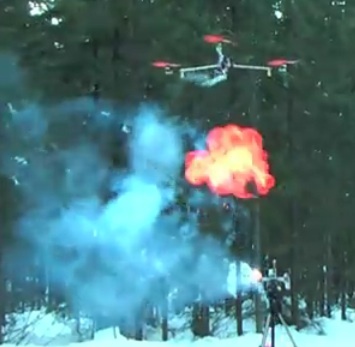 At this rate this may well become the Decade of Drones. Which makes me more than a little uneasy. Because when I put on my criminal hat—which I’ve been known to do for a living—I immediately start thinking of kit-built UAVs packed with Semtex and targeted via GPS. Voila, poor man’s cruise missiles, available to any hardware hacker with a grudge; all s/he needs is their target’s address. Fortunately, the powers that be have not fostered entire generations of experienced explosives experts with angry political grievances, right? Oh. Oops. Well, at least it’s not like engineers seem disproportionately likely to become terrorists… oh, wait. Then there’s the smuggling problem. Colombian and Mexican drug cartels already use homemade submarines and build air-conditioned railway tunnels. You can bet they’ll be jumping on the drone train sooner rather than later. UAVs and USVs (unmanned submersible vehicles) are the ultimate mules; they’ll go anywhere, they’re reusable, and if and when they’re caught, you know they won’t cut a deal. How can you track a drone built from off-the-shelf parts, flown in from parts unknown, back to its sender? Easy: you can’t. What makes drones dangerous is that, unlike most technologies, they can and will decouple criminals from their crimes. That makes them big trouble waiting to happen. The first extra-military drone assassination—and I’ll go on record now and predict one within the next five years—will doubtless trigger a cacophonous symphony of handwringing, tooth-gnashing, and the passing of lots of stupid and restrictive laws, but it will already be much too late. The twin genies of aeronautical engineering and microcontroller design are long out of their respective bottles. Tomorrow’s UAVs will make today’s look like the Wright Brothers’ biplanes, and the only way to track and fight them will be with yet more drones. Hello, panopticon. Goodbye, privacy. Granted, I’m verging on science fiction here, but it’s science fiction that doesn’t seem all that evitable. The drone economy will soon be even bigger business than it already is … but I can’t shake the sense that it will ultimately be bad news for us all. Ponder that the next time you take your Parrot for a spin.